"With a BSc in Biochemistry and Molecular Biology from the University of Western Australia, I started my postgraduate career in the world of cell signaling and transgenic research at the Laboratories of Cancer Medicine at Royal Perth Hospital. After a number of years I relocated to the UK and started working in clinical diagnostic laboratories where I had a change of direction in my career. 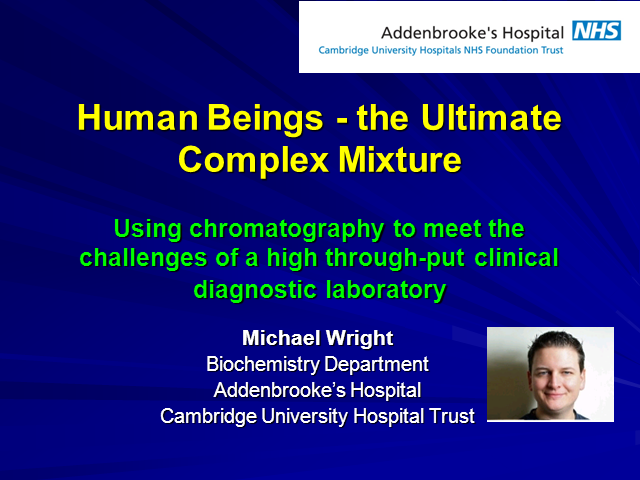 Moving into the development of HPLC and LC-MS/MS methods for clinical diagnostic analysis, I plied my trade at Guys Hospital and King’s College Hospital’s in London for 6 years before taking my current post at Addenbrooke’s hospital in Cambridge in late 2009. My work interests include new born screening, biogenic amines, steroids and vitamin analysis in an array of human sample types."